I know there are probably times where I sound like a broken record about this topic, but if you are a blogger, author, or online business owner, your email list is one of the most important tools in your tool belt. However, the key to getting the most out of your email list isn’t necessarily having the most subscribers. It’s turning those subscribers into rabid fans and — eventually — loyal, paying customers. People sign up for email lists for many reasons. Sometimes, they just like your blog. But more often, they sign up because you’ve given them an incentive — like a lead magnet — and they want to get their hands on whatever you’re offering (way to go, growth ninja!). Now I don’t mean to sound harsh, but once they sign up for your list in exchange for the lead magnet, they probably don’t care whether they hear from you again. So, if you want to turn indifferent lead magnet junkies into loyal subscribers, what you do after they sign up (and how you do it) is super important! 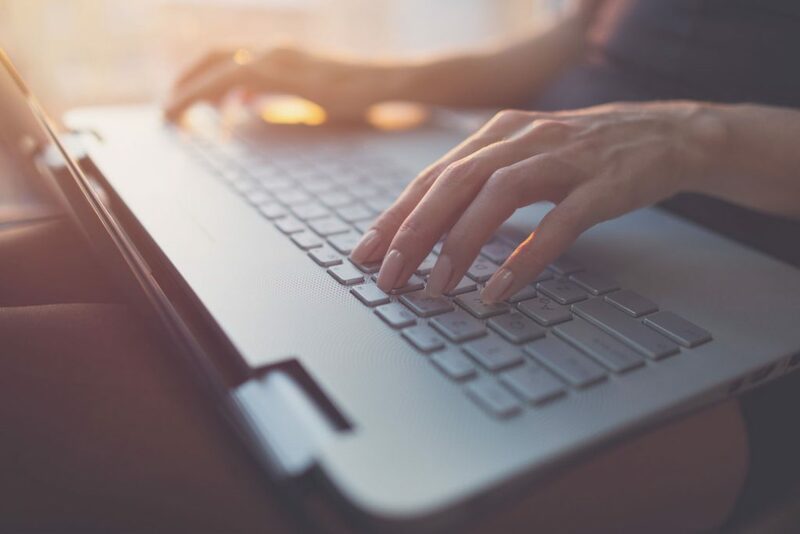 As the old saying goes, “You only get to make a first impression once.” Your first interaction with a new email subscriber is a chance to either build the foundation for a long-lasting and meaningful relationship OR force them to hit the “unsubscribe” button. Think about it this way: you decide to go on a dinner date with someone you met through an online dating app. You arrive at the restaurant, your date introduces themselves, tells you one or two things about themselves… and then sits silently across the table for the entire meal. After an hour of excruciatingly awkward silence, you walk out of the restaurant, and all of a sudden your date says, “So how about a kiss?” You’d probably think they were crazy! Let’s say you’re building your email list and when someone subscribes, you send them a welcome email… but then not much else. When you’re ready to do a product launch, all of a sudden you’re randomly sending them an email to promote yourself and your product. In that situation, you’re just like the silent date! Instead of using the time between introducing yourself and asking for something to develop the relationship, you go completely radio silent. You haven’t nurtured the relationship or built the trust necessary for you to make that kind of request. That’s when you’ll find yourself facing a flurry of unsubscribes. This is why nurturing your email list is so important. 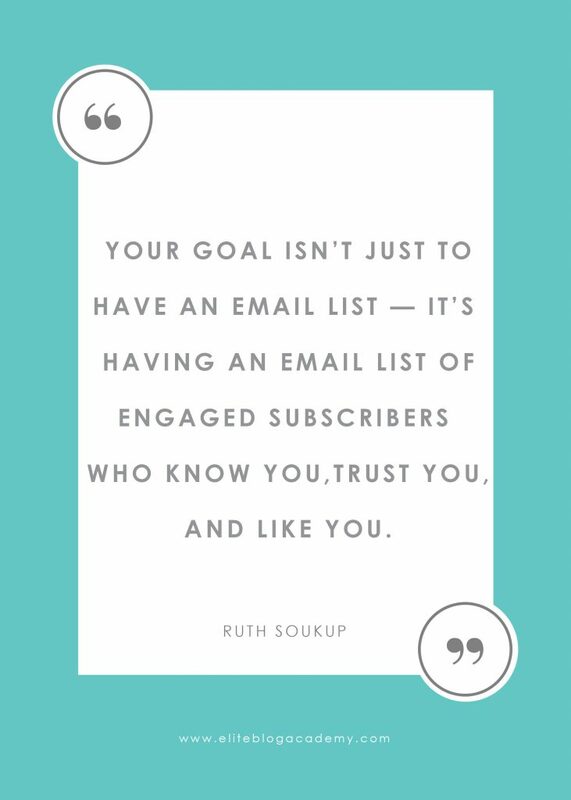 Your goal isn’t just to have an email list — it’s having an email list of engaged subscribers who know you, trust you, and like you. The reality is, your subscriber’s first impression is likely to be their forever impression. Starting in your very first email, you want to show them who you are, what you’re about, and that you’re dedicated to building a relationship with them. When someone subscribes to your email list, send them a welcome email introducing yourself and your blog. You can also outline what they can expect from you and what kinds of awesome benefits, freebies, and other cool stuff they have to look forward to now that they’re a part of your list. The point of the welcome email is not only to introduce yourself, but also to convince them that signing up for your list was the right decision and they should stick around. Then follow up with a few other emails to continue building the benefit. Your first week with a new subscriber is like the first week of falling in love with someone new — you’re so excited that you want to spend all your time with them to show them just how amazing you are and how great your relationship can be. Giving your new subscribers the same attention and care you’d give a new relationship is great way to make a killer first impression. One of the keys to building a great relationship with your subscribers is through building trust. And one of the best ways to show them they can trust you is by being regular and reliable with your emails. You want to deliver awesome content to your audience on a regular basis so they come to expect (and look forward to) your emails in their inbox. Choose the frequency and day of the week you’ll send emails and stick to that schedule. I think one email per week is the sweet spot. More than that can be a little overwhelming. Less than that and you run the risk of your subscribers forgetting about you. When you make a regular appearance in your subscriber’s inbox, you’ll prove to them you’re a reliable source of awesome information. With every email, they’ll trust you a bit more. One of the quickest ways to make people unsubscribe is by being overly sales-y. No one wants to be sold to all the time. While your ultimate goal is to turn your subscribers into paying customers, sending them sales pitches 24/7 will quickly turn them off. The key to engaging your email subscribers successfully is to be authentic. This is true whether you’re running a promotion or writing your regular weekly content. Your emails should feel conversational, real, and easy to read. Instead of focusing on driving revenue with hard sales tactics, try focusing on adding value to your audience. For example, let’s say you’re promoting a new product. Your first email can introduce your audience to the product. The next email could be a Q+A or a case study outlining exactly how your product is helping people just like them. Or something I LOVE to do is boot camps. This past year, I did a “Best Week Ever” boot camp with my email list, where we sent out a promo code for a free printable every day for a week between Christmas and New Year’s Day (my favorite week of the whole year!). Each printable was a different challenge of how they could make the most out of those seven days, and each tied back to one of our products. We were selling to them, but we were also providing super valuable content, so it was a total win-win. Plus, it felt totally authentic — in my book, the week between Christmas and New Year’s Day is totally the best week ever, so I was really excited to write about it and share how thrilled I was. The point is, if you want to drive sales, you need to be genuine and authentic. Your emails — promotional and otherwise — should build your relationship with your audience and deliver major value. When you create so much value that you start getting thank-you notes for your promo emails, you’ll know you’re on the right track. Have you ever had a friend who was super nice whenever they needed something, but then dropped off the face of the earth when they didn’t? I think we’ve all had that friend, and it’s never a fun or positive experience. The last thing you want to be is THAT friend to your email list. To nurture your email list, you need to be in consistent communication with them. You need to interact with them and add value to their lives regularly — not just when you need something from them. In my email newsletter, I try to take something that’s happening in my life each week and spin it in a way that adds value and helps my reader. You want to get personal (it helps to build the relationship), but the personal things you share should have a purpose and add value. When you put your focus on the reader, you’ll be able to pack every email you write with tons of value. One of the best tricks for building an engaged and loyal email list is to use segmenting. Segmenting is separating the people on your list based on their interests.Click To Tweet This gives you the opportunity to send hyper-focused messaging to specific groups of people on your contact list. So, for example, let’s say you have one lead magnet focused on budgeting and another focused on decluttering. Whenever someone opts in, you can tag where they come from so you know if they’re all about the budgets or more focused on getting their declutter on. Then you can send decluttering-focused content to one segment and budgeting-focused content to the other. It’s awesome! Your readers get content they’re excited to read, and you deepen the relationship and up the chances of converting those readers into customers. We segment our list in lots of different ways: people who have purchased specific products, people who have clicked on certain links, people who’ve taken our assessment test. The more you can segment your list, the more personalized you can make your content. Just make sure that when choosing an email system, you get one with options to tag people and create different segments in your list. One thing I think a lot of people let get in the way of sending emails is formatting. I know I did! You think you have to come up with this beautiful, well-designed, structured, and formatted email before you can send it. But let me be the first to tell you: you totally don’t have to stress about this. In fact, the less formatting you use, the more likely your subscriber is to read your email. There’s no need to go crazy with images, pictures, and crazy formatting tricks. The more you add, the more overwhelming it can feel to your reader. Definitely avoid using an image or header at the very top; that’s a quick ticket to the “Promotions” folder. In general, limit the bells and whistles on your emails. Readability should always trump cute! Also, since a ton of people will read your email on their cell phones, you want to make sure it’s mobile-friendly. If your email is overly formatted and heavy on the images, chances are it won’t look great on a mobile device. 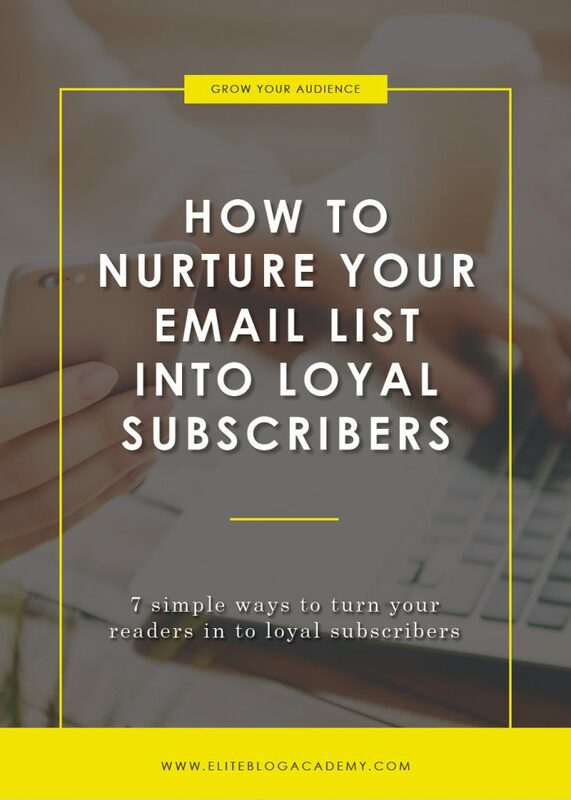 The last tip for nurturing your email list into loyal subscribers is to pay attention to connection. Ultimately, the goal is to deliver content that resonates with your audience. When something resonates with you, you want to stop what you’re doing and pay attention. Figure out which topics resonate and find ways to send more content about it. How do you know when something resonates? For me, it’s when I send out an email on a certain topic and I get a ton of emails in response. The more people that reach out, the more I know that whatever I said touched a nerve. As you continue to write and see how your audience responds, you’ll start to understand them and what they’re connecting to. When you pay attention to the connection, you can continue to write things that connect. And THAT’S the key to converting your audience from indifferent to loyal readers. Nurturing and building a relationship with your email list is an ABSOLUTE MUST. Personally, I love emails! I think it’s a chance to get real and raw with your readers and build that intimate and authentic connection. The more you focus on that connection, the more loyal your subscribers will become. Now, just a heads up — the more authentic you are, the better chance you have of building a real relationship. But on the flip side, there’s also a chance that your authenticity will push some people away. Don’t worry about the unsubscribes. No matter how amazing you are (and I know you’re amazing! ), there will always be people who don’t want to hear from you. Don’t focus on what’s not working. Focus on what IS working, and give those loyal subscribers exactly what they’re looking for. Wow Ruth, this really blessed me. I’ve been unsure how to tackle the email newsletter. But this really made me feel a little less…unsure and scared. What a hard balance to walk in- not selling, but selling, but being yourself, but speaking to your niche…thank you for doing what you do. I’m really thankful I found Elite Blog Academy. Thank you for this informative article. I’m just getting started, and I I appreciate this advice. One question: if you’re just starting out, is it better to send weekly emails with value, like an article within an email, or to start a blog and link to the posts? So, I guess a second question might be is it better to interact through the emails or comments in blog posts? This was very helpful! My growing email list is semi-engaged but I know I can do so much better. I struggle the most with how to segment my list without all those weekly emails becoming overwhelming for me. And because I have 4 distinct blog categories that I write from each week, I’m not always sure if I should send my latest posts to all my lists. Thanks for making email lists simpler! Awesome article!! Another one that I needed to read! Thank you! Thanks this information came at the perfect time. I found an opt-in that solves major problem. My list.is starting to build. This article is a great next step after the intro e-mail series I set up with the information from the class. Thanks, so much to do. Printing this list and posting it in my office. Great info? Thanks, Ruth. Another EBA golden nugget! Thank you for this amazing list! I have had a hard time with my subscriber’s list and an even harder time figuring out what to write. I have been making my emails more open and personal than I have my blog because I wanted to develope a bond with my subscribers. I’ll continue on that path and keep an eye on what content clicks with my subscribers and go from there. You’re awesome, thank you!!!! I love your ideas. Thanks for sharing. I appreciate your easy and refreshing style. Glad I found Elite Blog Academy.